Representatives from Enbridge Inc. faced questions from the public at a meeting in Petoskey on Tuesday night. Enbridge operates an oil pipeline under the Straits of Mackinac, which has drawn fire from opponents concerned with the company's safety record. 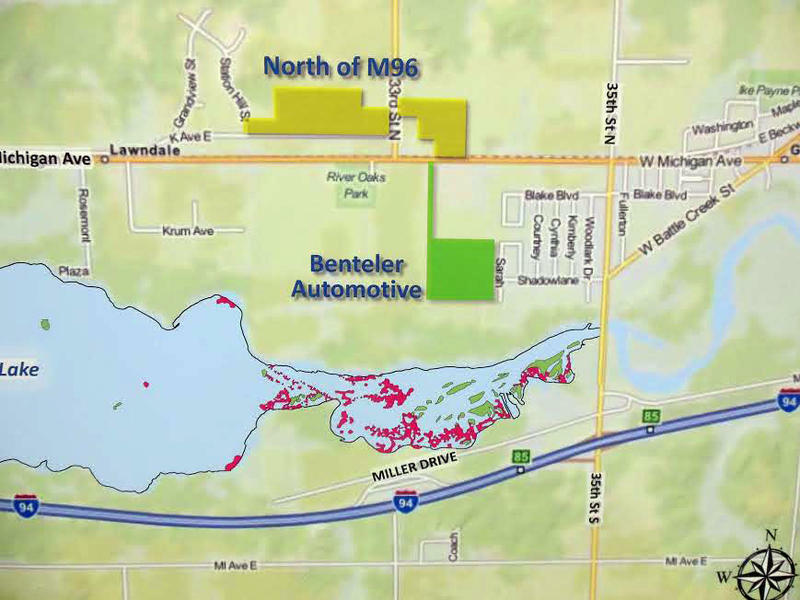 The corporation was responsible for a major spill in the Kalamazoo River in 2010. That bit of recent history has some people concerned. For decades Enbridge has sent thousands of gallons of oil each day through the Straits of Mackinac. It's called "Line 5," and it carries oil from Superior, Wisconsin -- to Sarnia, Ontario. That pipeline is causing anxiety among many people in Michigan. They're worried about a worst-case scenario, where a major rupture in the pipeline could send thousands of gallons of oil pouring in to the Straits. "Some things can't be replaced," says Matt Crehan. "And if you go ahead and pollute that big of a water supply, the chances of ever bringing it back to normal are slim to none." Crehan drove from Grand Rapids to the meeting in Petoskey, where he's carrying a sign that says Line 5 is a "ticking time bomb." Enbridge says the crossing is safe. "The pipeline is in very good condition," Brad Shamla says. He's the Vice President of U.S. Operations for Enbridge. "When it comes to places like the Straits of Mackinac, we are putting a lot of time and attention and detail into that pipe segment to make sure that we understand that pipe segment and are making continual improvements." Still, others argue that Enbridge isn't maintaining the line properly. Michelle Halley is an Attorney with the National Wildlife Federation. She says the organization hired a dive team recently to survey Line 5 at the Straits. "We found lots of areas where there were no supports underneath the line," Halley says. "Where there were piles of unidentifiable debris on top of the line." This kind of skepticism about Enbridge's commitment to safety is common. And it's a concern that Tip of the Mitt Watershed Council hoped to have answered at the pipeline symposium they hosted at Petoskey High School. Gail Gruenwald, Executive Director of Tip of the Mitt, says it's hard for the public to get a straight answer about pipeline safety. "There's a huge amount of secrecy in the oil and gas industry in general," Gruenwald says. "And it raises a lot of issues about transparency and regulations for the public." But at the meeting, Enbridge -- along with representatives from state and federal government -- answered specific questions about Line 5's safety. Panelists faced numerous queries about what the response to an incident at the Straits would look like. Who would be first to the scene? How long would it take to contain the spill? Who's responsible for different parts of the clean up effort? The answer to who's responsible for cleaning up is a complex one -- there's a lot of people involved, including Enbridge. But the United States Coast Guard would coordinate things on the ground in the first 24 hours. Steve Keck is with the Coast Guard in Sault Ste. Marie. He says the response by them would be massive -- and quick. "Hundreds of personnel within that first 24 hours," he says. "But ideally Sector Sault Ste. Marie would have their pollution investigators down there within an hour." There was one question raised at the meeting more often than the rest: What would happen if a spill occurred in the winter? Keck says the Coast Guard has been planning and training for a winter incident at the Straits for years. They held a drill last winter, and they've got one planned for this year too. "A couple of years ago we had to almost cancel our drill because there was no ice in the Straits," Keck says. "Whereas this year we had real nice ice cover to practice in." "The techniques that we're learning in the Straits of Mackinac are being used in Alaska as well." Enbridge says the corporation monitors all of their pipelines 24 hours-a-day from a command center, so they'd know immediately if something happened at Line 5 under the Straits. They also plan to inspect the pipeline later this year. But those safety efforts will likely not be enough to calm the anxieties of the Michigan Coalition Against Tar Sands. The group protested in front of Petoskey High School before the meeting, where they installed a giant sign. Enbridge Energy is still cleaning up oil left over from its pipeline spill in the Kalamazoo River. The company has already recovered most of the oil, but it's still working to comply with an order from the federal regulators, who say they need to clean up another 180,000 gallons. According to Enbridge's new plan, they can start that cleanup March 15. But that's all dependent on this crazy weather. Right now, everything is frozen. But, if spring warms things up and there's flooding, that can also be problematic for the dredging process. An interview with Todd Spangler. Emergency unemployment benefits and senatorial "jitters" over an Enbridge oil pipeline running through the Straits of Mackinac: Both are issues consuming attention from Michigan's congressional delegation. More than a week ago, a federal unemployment benefits program expired, leaving 1.3 million jobless Americans without aid. Some 45,000 of them are here in Michigan. The program is the Emergency Unemployment Compensation program. In Michigan, the EUC added 36 more weeks to the state's regular 20 weeks of benefits. On Capitol Hill today, Democrats are trying to pressure House Republicans to extend the program for three more months. Meanwhile, the Obama administration is trying to ease concerns over an oil pipeline in the Straits of Mackinac. Detroit Free Press Washington reporter Todd Spangler joins us now to tell us more about these issues. A group of U.S. and Canadian citizens that advises the Great Lakes Fishery Commission says an aging pipeline under the Mackinac Bridge should be replaced. They say there’s too much danger of a “catastrophic” oil spill in an “especially sensitive area” with fast-moving currents and frequent ice cover. Enbridge Energy says this four-mile stretch of “Line 5” meets all modern regulations and that it has seamless metal walls an inch thick. But it is 60 years old, and this is not the first citizen group to call for its replacement.